The dealer wouldn't do any more looking until I returned the intake to factory so I did. Removed catch cans and rerouted them back they way the were, removed the beastmode intake and went back to the factory box. Took it for a spin on the interstate and the horsepower was definitely lower but no code returned. I was content to live with it for a little while. 2016 Vitamin C VT w/ MT. Are you able to log fuel rail pressure on hard throttle? Sounds like the classic binding fuel line issue. I have checked it a few times. The limp mode issue was the only time it was low. This morning I was heading to the shop and it ran fine. The P0191 was gone and the P2191 was back. I drove it a couple of times until the light came back on and took it in. The shop logged fuel rail pressure for several runs as well and determined it was normal. They tested what they could today and checked the fuel. A lot of deposits and they said it was about 20-25% ethanol. They said to run the fuel out and fill up with 87 or 89 from Shell or Valero. If the code comes back, bring it back to them. The guy told me this has their whole shop baffled along with everyone at Hyundai Techline. They finally said that the intake was not the cause and I could put it back on. So I'm still here with a 4 cylinder getting about 20mpg and a CEL that nobody at Hyundai can figure out. Last edited by E9C900A; Yesterday at 09:06 PM. Most likely causes if no leaks or faulty wiring or connections will be the fuel pump/s, fuel line(low pressure side), or the fuel rail pressure sensor. I had a guy who had this issue that was highly modded and it ended up being the fuel rail pressure sensor causing the same codes you have. I'm using my Ultragauge to check things, not relying on Hyundai Techs alone. I still think it's a bad O2 sensor, but they disagree. 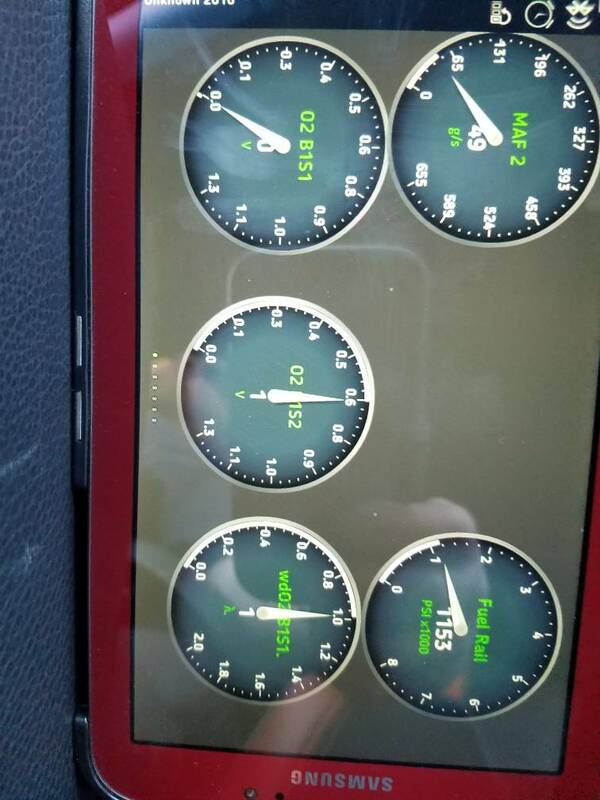 Here's a shot of my ultra gauge at about 75mph pulling a slight hill. Last edited by tobs54; 03-26-2019 at 05:49 PM. I'm still playing with the ultragauge to figure out how to log data and how to share it. Thanks for the info. Last edited by tobs54; 03-26-2019 at 05:20 PM. And now my favorite thing about car issues. I reset the CEL Tuesday evening and it hasn't come back. I just now filled up with 87 octane from Shell. That's the first non-93 gas in her for the last year. We'll see how this goes and how long the CEL stays gone. So I guess my issue was just bad gas... wtf? Or that fuel injector cleaner worked.